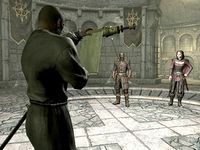 This article is about the Dawnguard version of this mission. For the vampire version, see Prophet (Vampire). Find and rescue a Moth Priest from the vampires. Speak to Isran, then to Serana. Ask around for a Moth Priest. Search along the road south of Dragon Bridge. Investigate the scene of the attack. Rescue the Moth Priest from Forebears' Holdout. "You're a resource. You're an asset." 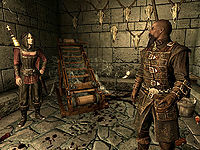 Once you have recruited Sorine Jurard and Gunmar into the Dawnguard, and Isran has welcomed them to Fort Dawnguard, you are told to follow Isran for a little interrogation session with the newly arrived vampire, namely Serana. When asked what she is doing in the enemy fort, she will explain: "I'd rather not be here either, but I needed to talk to you. It's important, so please just listen before your friend, here, loses his patience. It's... well, it's about me. And the Elder Scroll that was buried with me. I'm guessing you figured this part out already, but my father's not exactly a good person. Even by vampire standards." She then proceeds to explain that her father once was a better person but stumbled upon a prophecy that foretold vampires could control the sun, thus not be afraid of daylight. She finishes with: "That's what he's after. He wants to control the sun, have vampires control the world." Serana and her mother tried to stop him from taking over the world, so Serana was sealed away with the scroll, to keep it from her father. She realizes she is in a fort filled with vampire hunters, but agrees to try and persuade Isran to let her help. Once again, you will have to do the talking, although Isran will be his usual paranoid self: "All right, you've heard what it has to say. Now tell me, is there any reason I shouldn't kill this bloodsucking fiend right now?" Regardless of your choice, Isran will agree to let Serana help out, but will turn to Serana and let her know: "Don't feel like a guest, because you're not. You're a resource. You're an asset. In the meantime, don't make me regret my sudden outburst of tolerance and generosity, because if you do, your friend here is going to pay for it." While Serana can't help but make fun of Isran's anger, she will turn to you and remind you that she carries the Elder Scroll on her back and that it is necessary to read it to understand the prophecy. 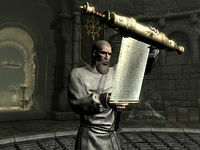 The only people who can read the scrolls are the blind Moth Priests who live in the Imperial City in Cyrodiil, a long way from Skyrim. Luckily, Isran noticed an Imperial scholar passing by on the road just a few days ago. He is unwilling to waste men looking for him, but suggests that you ask innkeepers or carriage drivers all over Skyrim. Serana, however, suggests the College of Winterhold as a place where a scholar would go. Either way, Serana feels adventurous and will be your follower on the search for the scholar. All of them will provide information, although you will have to persuade them (with a Speech skill of 50), or successfully bribe them to get the information. The only innkeepers that provide information are the current innkeeper (Corpulus Vinius or Sorex Vinius) at the Winking Skeever in Solitude and Hulda at The Bannered Mare in Whiterun. You will have to persuade them (with a Speech skill of 50) or successfully bribe them to get the information. The librarian in the Arcanaeum, Urag gro-Shub, will provide the information without any demands. Your rank at the College does not affect this. With all clues pointing to the small settlement of Dragon Bridge, travel there and ask the locals if they have seen a Moth Priest. Some will not even have the topic, while others will claim they know nothing about a traveling priest. The only people who ever noticed a caravan traveling through town are the local guards and young Clinton Lylvieve, who will say: "I don't know what a Moth Priest is, but I did see an old man in a robe not long ago. He was riding in a wagon with some Imperial guards. They didn't stop to visit, though. They rode through town heading south, and went across the big bridge. It was only just a little bit ago. I bet you can catch them if you hurry up." Head southeast out of town and cross the old bridge. 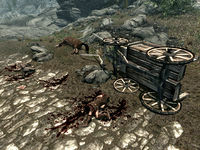 Stay on the path and before long you will see signs of a roadside attack, an overturned cart, a dead horse, a bloodstained corpse, a copy of the book Effects of the Elder Scrolls, and a dead vampire. Examine the vampire and read the vampire's note. The note points you towards a place named Forebears' Holdout, apparently where the attackers dragged the Moth Priest. Follow the bloodstains over the bridge to the east until you reach yet another attacked cart, with two corpses: a Redguard and a Nord. Follow the blood spatters to the northeast until you reach five standing stones, and the entrance to Forebears' Holdout. "The more you fight me, the more you will suffer, mortal." "I serve my master's will." Head down the slope and around the corner. Before long you will land on a balcony in a huge chamber with a river, and what resembles an old interior fort with a patrolling vampire, and a bluish orb glowing on the other side. Sneak down the stairs to the south and watch out for two patrolling death hounds on the ground level. Cross the narrow bridge leading west and follow the wall until an opening reveals a huge bonfire. Four vampires will immediately attack, so dispose of them and make use of Serana as she is quite strong with her ranged attacks. Head up the stairs where Malkus, the author of the note, will be busy trying to enthrall the imprisoned priest. Dispose of Malkus and claim the Weystone Focus from his corpse. Follow the marker up the stairs and activate the Weystone Source with the Focus you took from Malkus. The magical barrier will disappear and reveal the Moth Priest, although not in the state you expected. Instead, he will chant: "I serve my master's will. But my master is dead, and his enemies will pay!" The enthralled priest will then attack with everything he has got, so fight him until he yields. He will then stutter: "That... that wasn't me you were fighting. I could see through my eyes, but I could not control my actions. Thank you for breaking that foul vampire's hold over me." You can now ask him several questions, but first he will introduce himself: "I'm quite alright, thanks to you. Dexion Evicus is my name. I'm a Moth Priest of the White Gold Tower. These vampires claimed they had some purpose in store for me, but they wouldn't say what. Probably hoping to ransom me, the fools. Now tell me, whom do you represent, and what do you want with me?" When you introduce yourself as a member of the Dawnguard, and that you need him to read an Elder Scroll, he will prove quite knowledgeable: "You have an Elder Scroll? Remarkable! If my knowledge of history serves me, I recall that the Dawnguard was an ancient order of vampire hunters. I will be happy to assist you with your Elder Scroll. Just tell me where I need to go." When you tell him to go to Fort Dawnguard, he will immediately be on his way and you are to report back to Isran. Before leaving, loot the chest nearby then exit the same way you came. "Among the night's children, a dread lord will rise." Now, if everyone will please be quiet, I must concentrate. I see a vision before me, an image of a great bow. I know this weapon! It is Auriel's Bow! Now a voice whispers, saying "Among the night's children, a dread lord will rise." In an age of strife, when dragons return to the realm of men, darkness will mingle with light and the night and day will be as one. The voice fades and the words begin to shimmer and distort. But wait, there is more here. The secret of the bow's power is written elsewhere. I think there is more to the prophecy, recorded in other scrolls. Yes, I see them now... One contains the ancient secrets of the dragons, and the other speaks of the potency of ancient blood. My vision darkens, and I see no more. To know the complete prophecy, we must have the other two scrolls. This ends the quest and starts the next two quests, Chasing Echoes and Seeking Disclosure. After rescuing the Moth Priest and returning to Fort Dawnguard all the ordinary Dawnguard members will start greeting you as a friend, and become available as followers. Also, at the same time, if you are not already Blood-Kin to the Orcs, Durak will grant you that status. If you pickpocket the Weystone Focus and activate the Weystone Source without being detected, the Moth Priest will be freed and immediately attack the surrounding vampires. After defeating them, he will still be aggressive towards you, but he should then have significantly less health and be an easier fight. 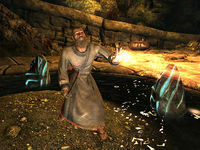 After Serana has told you to locate a Moth Priest, you can speak with Gunmar and he'll give you some Dawnguard Armor pieces. Serana will not automatically become your follower if you don't speak to her about where to find a Moth Priest, or if you already have a follower. If Dexion is outside of the magic barrier when you first see him, or if you manage to speak with him and tell him to meet you at Fort Dawnguard before he becomes hostile towards you, he ends up becoming permanently hostile after that point. Reloading and making sure he is in the magic barrier, then playing the quest sequence in the proper order (rescue, defeat, then speak to him) will resolve this. It is also possible to use Bend WillDB on Dexion if you've got two or more words of the shout to let him stop attacking everyone. If reloading does not get Dexion to spawn inside the magic barrier, it is also possible to complete the quest by simply not interacting with the magic barrier. You can defeat the vampires and send Dexion to Fort Dawnguard without him ever turning hostile. 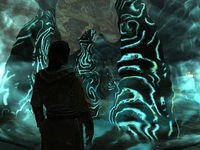 Deactivating the magic barrier is not mandatory for completing the quest and if you looted the Weystone Focus from Malkus' body, it will cease to be a quest item (and thus can be dropped) after reporting back to Isran. Doing this may turn the Dawnguard hostile towards you. Before quest stage 41, use the console command prid xx007B88, followed by moveto xx00313A. It is also possible to fix this by adding him to your own faction via the console. Select him by clicking on him or typing prid xx007B88, and then typing addfac 0005A1A4 1. If the previous solution doesn't work for you, select Dexion, and use the console command disable followed by enable. If the previous solution doesn't work for you, open the console and select Dexion, either by clicking on him or entering prid xx007b88 (the first two digits vary depending on loaded mods), then use the command setav aggression 0. This makes Dexion passive again and the quest can proceed normally. Malkus may spawn inside the magic barrier, not allowing you to loot the Weystone Focus key needed to deactivate the barrier. After the cutscene between Isran, Gunmar, and Sorine when you first enter the fort, the three NPCs can become stuck as "busy" when given the quest update to follow Isran. Walking through the main gate to outside then waiting 24 hours, or curing yourself from vampirism if you became a normal vampire when you have chosen the Dawnguard side, can possibly fix this. This is caused by two divergent scripts running at the same time. After Dexion finishes reading the Elder Scroll, the quest dialogue might not progress. Use the console command setstage DLC1VQ03Hunter 200 to complete the quest. 5 When I returned to Fort Dawnguard, Isran told me that he needed to speak to me, and he asked me to follow him. 7 When I returned to Fort Dawnguard, I was surprised to learn that Serana had come to the base searching for me. She claimed to have something urgent she needed to tell me. 10 When I returned to Fort Dawnguard, I was surprised to learn that Serana had come to the base searching for me. She claimed to have something urgent she needed to tell me. 15 Serana told me that her father was trying to gain power over the sun by fulfilling a prophecy found in the Elder Scrolls. If we could read the prophecy, we might be able to stop him. Serana had one of the scrolls, but we'd need a Moth Priest in order to read it. 17 Serana told me that her father was trying to gain power over the sun by fulfilling a prophecy found in the Elder Scrolls. If we could read the prophecy, we might be able to stop him. Serana had one of the scrolls, but we'd need a Moth Priest in order to read it. 20 Serana told me that her father was trying to gain power over the sun by fulfilling a prophecy found in the Elder Scrolls. If we could read the prophecy, we might be able to stop him. Serana had one of the scrolls, but we'd need a Moth Priest in order to read it. 30 Serana told me that her father was trying to gain power over the sun by fulfilling a prophecy found in the Elder Scrolls. Only a Moth Priest can read an Elder Scroll, so we've set out to find one. 45 Serana and I heard a rumor that a Moth Priest recently visited Solitude. He was thought to have stayed at the Winking Skeever. 50 Serana told me that her father was trying to gain power over the sun by fulfilling a prophecy found in the Elder Scrolls. We've set out to find a Moth Priest who can read Serana's Elder Scroll, and the trail has led us to Dragon Bridge. 52 Serana and I are one step behind the Moth Priest. We journeyed to Dragon Bridge and learned that he had passed through the town, heading south across the bridge. 60 Harkon's vampire agents have captured the Moth Priest and taken him to a place called Forebears' Holdout. I must rescue him before the vampires can break his will. 65 Harkon's agents have captured the Moth Priest! I have tracked them to Forebears' Holdout, but the vampires have enthralled the moth priest and I will have to confront him in order to break their hold. 66 Harkon's agents have captured the Moth Priest! I have tracked them to Forebears' Holdout, but the vampires have enthralled the Moth Priest and I will have to confront him in order to break their hold. 70 Harkon's agents captured the Moth Priest and enthralled him, but I was able to break their hold on his mind. 80 I rescued the Moth Priest from his vampire captors and asked him to meet me at Fort Dawnguard. I must return to Isran and tell him of our success. 90 With the Moth Priest safely back at Fort Dawnguard, he can now read Serana's Elder Scroll and learn more about the prophecy that Harkon is hoping to use to gain power over the sun. 100 With the Moth Priest safely back at Fort Dawnguard, he can now read Serana's Elder Scroll and learn more about the prophecy that Harkon is hoping to use to gain power over the sun. The following empty quest stages were omitted from the table: 0, 61, 67. On the PC, it is possible to use the console to advance through the quest by entering setstage DLC1VQ03Hunter stage, where stage is the number of the stage you wish to complete. It is not possible to un-complete (i.e. go back) quest stages, but it is possible to clear all stages of the quest using resetquest DLC1VQ03Hunter. This page was last modified on 19 March 2017, at 16:21.